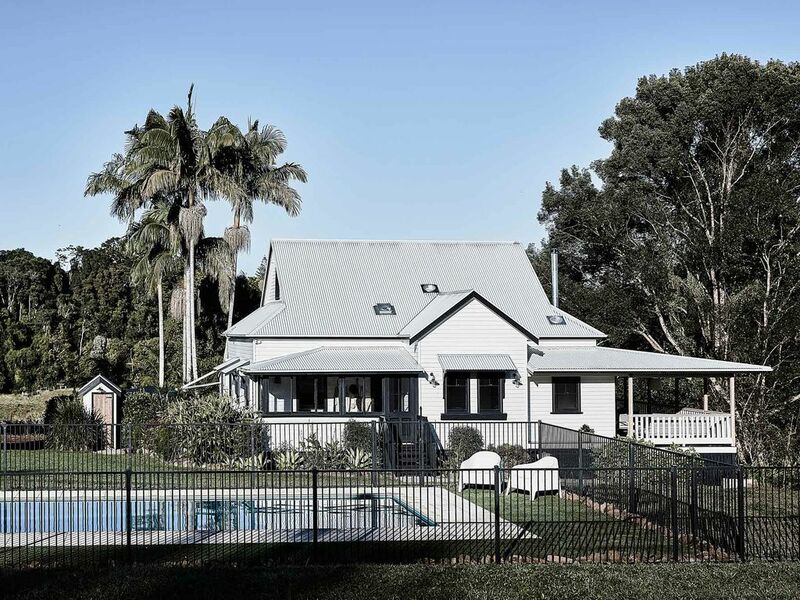 Located just 10 minutes to beautiful Bangalow is Benny’s Cottage, which has recently undergone a complete facelift and is ready to show off it’s relaxed and stylish new design. No luxury has been spared on this recent remodel, crafted with love by a talented local builder and interior stylist duo. This luxurious, hinterland holiday escape sleeps up to 10 people with 4 bedrooms and 2 bathrooms, plus a private loft area with an additional lounge. Wave hello to your only neighbours, the friendly ducks and gentle cows, happily wandering the surrounding paddocks. This magical property gives you the peace and tranquillity found only in the country but within easy reach of shops, restaurants, and more in Clunes and Byron Bay. 4 beautifully decorated bedrooms are located across both floors of Benny’s Cottage, including a loft bedroom with additional lounge space, offering added flexibility for guests. The bathrooms each feature modern, high-end fixtures and sleek design. With heated bathroom floors and towel bars, plus a freestanding soaker tub, you’ll be able to unwind and relax after a full day of adventuring. The living space is extended outward with a large but cozy verandah that hosts a lounge area, dining space and BBQ. A few steps further, discover your own private, saltwater swimming pool, protected by a paddock surrounding the entirety of the house. Spend your days relaxing poolside with a drink in hand or get out and explore the local landscape. Byron Bay is beloved for its pristine beaches, surfing, and scuba diving sites. Further inland you’ll be able to experience the mystery and magic of the Byron hinterland, from tiny villages oozing with country charm to ancient untouched rainforests. Whether you choose to curl up alone for your favourite Netflix drama or join your crew in the open concept living area beside the wood burning fireplace, there are plenty of ways to enjoy your evenings here. If it’s the outdoors you prefer, settle into a comfy spot on the verandah and watch the sun go down over the vast hinterland acres. Benny’s Cottage sits upon a delectable, 5-acre slice of hilly hinterland paradise. From the covered verandah, look down upon the cleared valley and listen to the peaceful sounds of the creek babbling past below and local birds singing their cheerful song. Enjoy watching cows happily munching on grass on the nearby paddocks or the property’s friendly ducks waddling past. Multiple outdoor spaces have been created for lounging and entertaining, including a large living space with a custom timber wood wall feature, an outdoor sink, and a dining table ready to serve your finest alfresco dinner. Fire up the gas barbecue and cook up something special while others take a dip in the spectacular, 12-metre saltwater swimming pool. With seemingly endless views of the immaculate hinterland hills, this is truly country living at its most luxurious. Nestled within 5 acres of private land, Benny’s Cottage offers privacy and space just 4 kilometres from Clunes. Pop into town to browse charming local shops and be sure to pick up some of the region’s finest coffee and macadamia nuts, grown locally thanks to the volcanic soils provided by nearby Mount Warning. Bangalow is just 12 minutes away for more designer shopping boutiques and restaurants, or cruise on another 15 minutes to the centre of Byron Bay for the world-famous surfing beaches, exceptional restaurants, and lovely nature trails.